It was unintentional, but the Great Easter Binge-a-Thon has kind of turned into monster central here, as the next film I have watched today is the 1986 remake of The Fly starring Jeff Goldblum and Geena Davis. This has joined today’s monster fest with Jaws, the Creature from the Black Lagoon and the zombies from Zombieland. 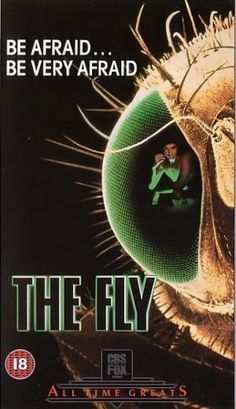 The remake of The Fly was one of those films that received a lot of positive remarks from members of the staff at Collider, and I had not seen it since it came out (and I am not sure I eve saw the entire film) so I thought this would be a good one to include. I love Jeff Goldblum, and there are plenty of Goldblum-isms here. The film wisely does not lose its sense of humor and the script keeps returning to that humor as a way to mask the fear of what was happening. At least that is until there is no room left for humor. And then it is horrifying. Again, much like the Creature, the practical effects may not look as realistic as some of today’s CGI films,but I think it is much more terrifying. Some of the things that happen to Brundle here – well, I would hate to have happen to me. Goldblum plays scientist Seth Brundle who is trying to impress journalist Veronica Quaife (Geena Davis) by showing her his new technology that was going to “change the world” in his words. It is a teleportation device that he has created. After some experimenting, Brundle believes that he has perfected it enough to teleport a living object. So he, like so many other mad-scientists, tries it on himself. However, a house fly found its way into one of the chambers and gets fused together with Brundle. At first, the changes were positives. Brundle had more stamina and strength, but soon he realized that there was going to be changes that altered what he was. David Cronenberg directed the reboot and brought a level of fright to the slowly transforming man. The man into a monster trope is certainly well represented among horror films, but this one is done with a flair and a humor that most do not attempt.